This advanced training provides an in-depth exploration of archetypes, cross-cultural myths, astronomy and planetary frequencies applied to points and meridians, exploring the more ancient beliefs and traditions of Each Asian Medicine. Beginning with an exploration of Taoist concepts of the Heavens, the Wu Qi, the Three Pure Ones and the Five Forces, you will gain a deeper understanding of sacred anatomy, the Eight Extraordinary Meridians, and our Celestial Stems and Terrestrial Branches. We also explore the role of story, myth and archetype with their physiological and psychological implications to inform treatment approaches. Working in teams, you will conduct assessments to plan and deliver in-depth treatments that incorporate tuning forks, hand chimes and essential oils. You will have the opportunity to develop your therapeutic skills of client assessment, treatment planning and more sophisticated sound layering on and over acupuncture points. 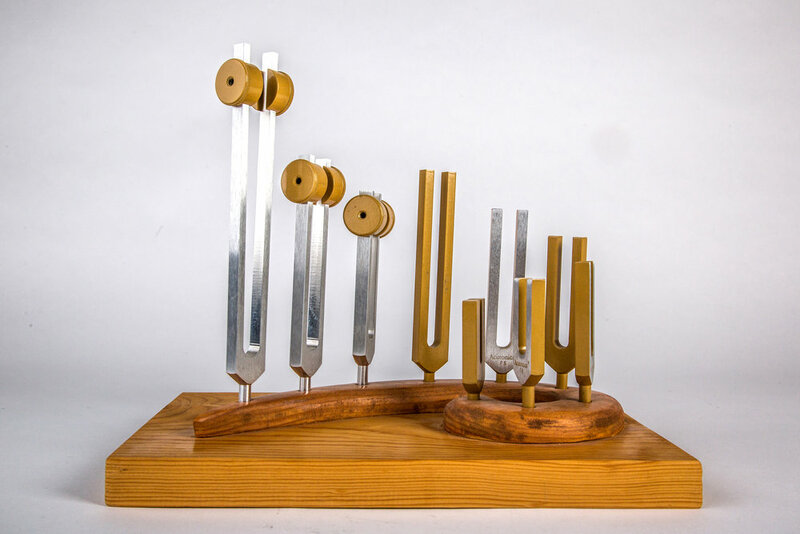 This comprehensive class introduces you to the Acutonics Planetary Mid-Frequency Tuning Fork and Acutonics Chiron Sets, the Planetary Gongs, the Acutonics Planetary Hand Chimes, and the Acutonics Harmonic Essentials Planetary Oils. This advanced class synthesizes concepts from previous levels by offering new insights into the scientific and psychological impact of sound and vibration. We discuss the relevance of dynamic rather than static models in science, culture and health care, introducing universal laws and principals, time-space synchronization, and theories in physics that address the bridge between mind and matter. We discuss Western conceptions of synchronicity developed by C.G. Jung and Wolfgang Pauli alongside Eastern conceptions of the relationships between psyche, synchronicity and the Tao. Binary star systems, precessional cycles and ancient civilizations provide a context in which to understand the history, relevance and physiological implications of Nibiru, the Planet of the Crossroads, one of the most potent frequencies used by advanced Acutonics practitioners. The history and science of asteroids, meteors and comets provides a foundation for the introduction of the archetypal qualities and healing attributes of the asteroid goddesses: Ceres, Pallas Athena, Vesta, and Juno. Through extensive hands-on experience you will broaden your understanding of the interplanetary intervals and learn how to integrate Acutonics® Chiron, Nibiru and Asteroid Sets into clinical practice for advanced applications in a clinical setting. You will continue to work in teams—conducting assessments, planning and delivering in-depth treatments that incorporate interplanetary intervals and a range of advanced sound layering techniques on and over acupuncture points. This advanced course provides you with a vehicle to explore the many faces and attributes of the Planet Sedna. This newly discovered planet has deep ties to indigenous cultures, Hopi and Mayan prophecy, the Inuit, and the taproot of Oriental Medicine. Sedna acts as a superconductor, representing non-duality, super-creativity, paradigm shifts and synchronicity. You will learn about the science, morphology, mythology and archetype of Sedna, and the key healing themes that unfold for humans, animals, the environment and the planet. The class also examines the latest theories in physics, pole shifts, and astrobiology. You will learn new intervals that use the Acutonics Sedna Tuning Fork Set as a new fundamental or home tone that supports highly transformational journeys. This class provides an opportunity to deepen and synthesize previous teachings while expanding your understanding of the application of tuning forks to the Extraordinary Vessels, points and meridians.